Museums on Us is a monthly promotion offering Bank of America customers free access to select museums on certain days. The program includes more than 175 institutions around the United States. This is a great opportunity for you to see a number of museums when you are traveling. Show your Bank of America, Merrill Lynch, or U.S. Trust credit or debit card along with a photo identification card to gain one free general admission to any participating institution on the first full weekend of every month. Merrill Lynch and U.S. Trust are both wealth management affiliates of Bank of America. Both debit and credit cards can be used for free admission. Children are not included (unless they have cards of their own) and each person must have their own card (in their name) for admission. Admission excludes special exhibitions, ticketed shows, and fundraising events. The museums change from year-to-year, so always check to see what museums are currently participating. Take a look at the museums in New York City that participate in the program. The Metropolitan Museum of Art is the largest art museum in the United States with art spanning 5,000 years from every corner of the earth. There are 2 million works on display. The Museum on Us program is honored at the Met on Fifth Avenue on the Upper East Side, and at the Breuer and Cloisters annexes. The Breuer focuses on modern art, while the Cloisters is dedicated to the art of medieval Europe. The Staten Island Zoological Society operates a small zoo on Staten Island independent from New York City's other zoos and aquariums. It opened in 1936 with a focus on reptiles. It is considered the first "educational zoo," in the U.S. The zoo continues its mission to provide education to children and veterinarian specialist interns. The American Museum of Natural History is one of the largest museums in the world containing more than 33 million specimens of plants, animals, fossils, minerals, rocks, meteorites, human remains, and human cultural artifacts. The 2-million square foot museum has 45 exhibition halls, a planetarium, and a library. More than 5 million people visit each year. 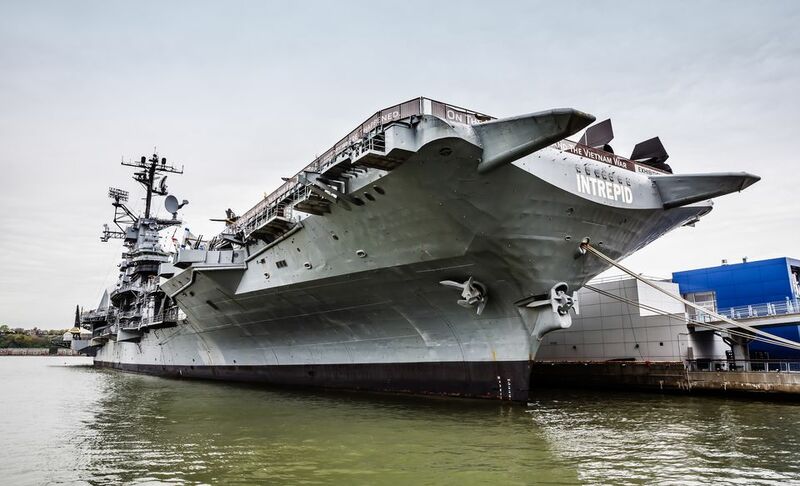 The Intrepid Sea, Air, and Space Museum is an American military museum that showcases the aircraft carrier the USS Intrepid, the nuclear submarine USS Growler, a Concorde SST, a Lockheed A-12 supersonic reconnaissance plan, and the Space Shuttle Enterprise. The Museum of the City of New York delves into the four centuries of known history about the inhabitants of the area that makes up New York City. It features history and art with more than 1.5 million items on display. The museum is located on the northern end of Museum Mile on Fifth Avenue. The museum was originally located at Gracie Mansion in 1923 when it was founded. The Queens Museum is an art museum that is housed in the New York City Building which was built for the 1939 World's Fair. Both the 1939 and 1964 World's Fair were hosted at Flushing Meadows-Corona Park. The museum's big highlight is the permanent exhibition, the "Panorama of the City of New York," a room-sized model of the five boroughs that was originally presented at the 1964 World's Fair. The Queens Museum preserves an archive of artifacts from both World's Fairs, which are on display. The Jewish Museum is an art and cultural museum also on Museum Mile on Fifth Avenue that features art and culture from throughout Jewish history. It was the first Jewish museum in the United States, as well as the oldest existing Jewish museum in the world.